More than 2,700 types of plants grow throughout the Chesapeake Bay region, in nearly every habitat: from upland forests to the Bay's shoreline to our own backyards. Plants help keep our air and water clean and provide habitat for countless animals. Arrow arum is a native perennial plant with large, arrowhead-shaped leaves. It grows in shallow, tidal fresh waters throughout the Chesapeake Bay region. 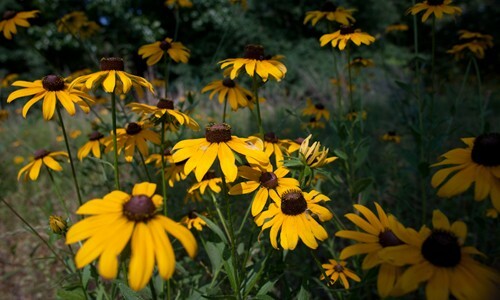 The black-eyed Susan is a native plant with golden yellow flowers that bloom throughout the summer. 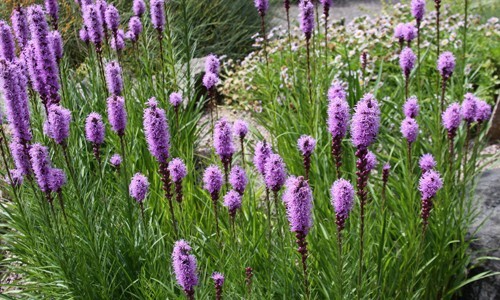 Blazing star is a native perennial plant with clumps of feathery purple or white flowers that bloom in summer. 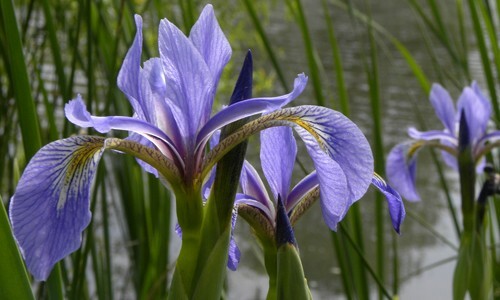 Blue flag is a native perennial plant with delicate violet flowers that bloom in spring. 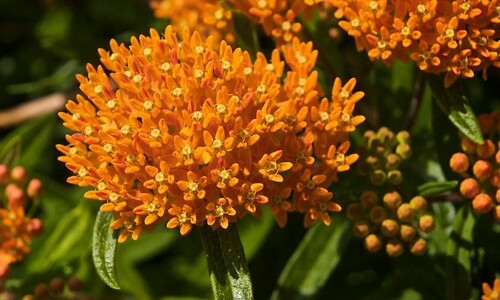 Butterflyweed, also known as butterfly flower or butterfly milkweed, is a native perennial plant with that blooms in late spring and early summer. 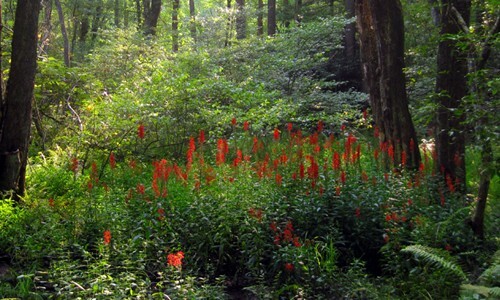 Cardinal flower is a native perennial plant with small, red, tubular flowers that bloom in late summer. 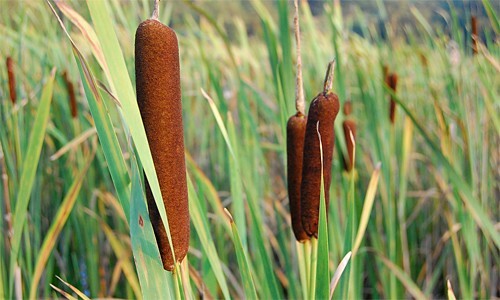 Cattails are a native perennial plant with distinctive brown, sausage-shaped “tails.” They grow in fresh and brackish wetlands throughout the Chesapeake Bay watershed. Dutchman’s breeches are native perennials with white flowers that look like tiny pantaloons. They can be found in woodlands throughout the watershed. 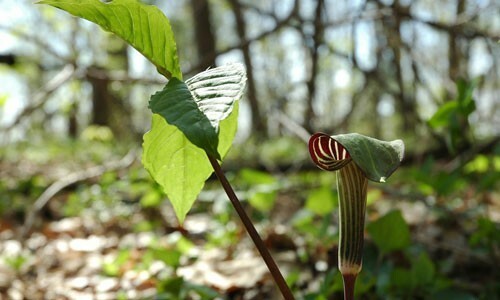 Also known as bog onion or Indian turnip, the jack-in-the-pulpit is a perennial plant in the Arum family, which includes relatives like skunk cabbage and arrow arum. 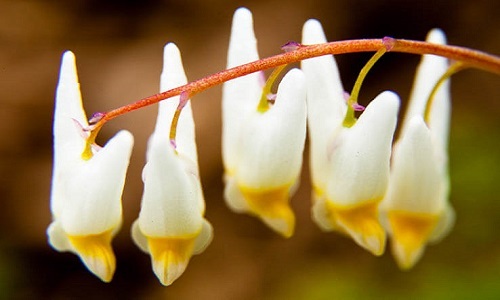 Its hooded flower blooms in the spring and gives the plant its common name. 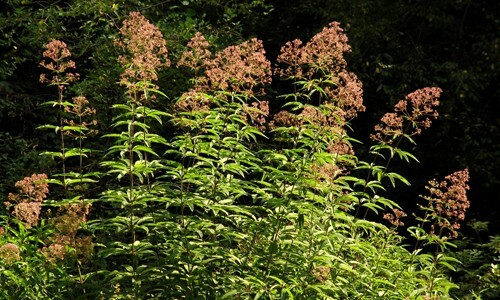 Joe-Pye weed is a native perennial plant with feathery, pinkish-purple flowers that bloom in mid- to late summer. 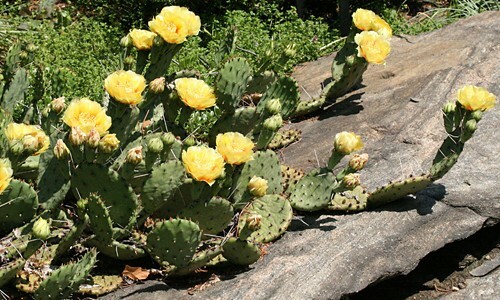 Prickly pear is a native perennial cactus with large, showy yellow flowers that bloom in late spring and early summer. 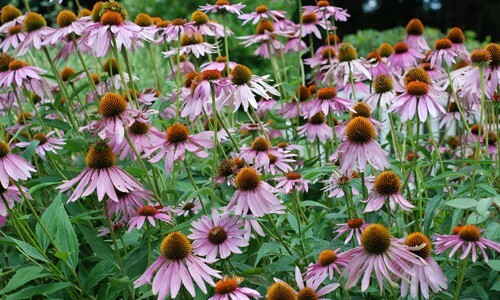 Purple coneflower is a native perennial plant with large, lavender flowers that bloom in early summer. 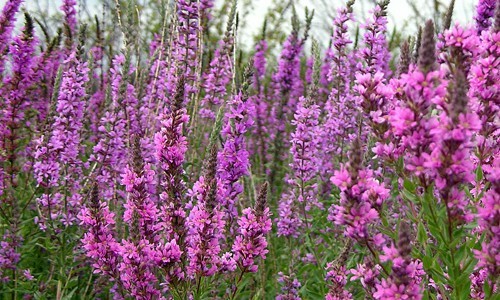 Purple loosestrife is an invasive perennial plant with spikes of bright purple flowers that bloom in mid- to late summer. Redhead grass is a bay grass with flat, oval leaves that wrap around the base of straight, slender stems. 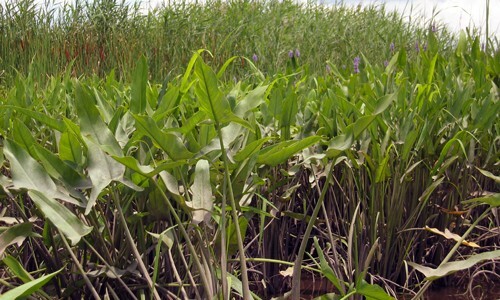 It grows in fresh to moderately brackish tidal waters in the Maryland portion of the Chesapeake Bay watershed. 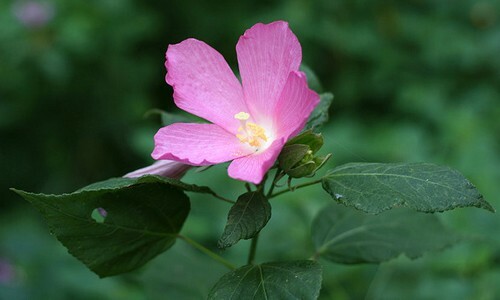 Rose mallow is a native perennial plant with beautiful white or pink flowers that bloom from mid-summer through early autumn. 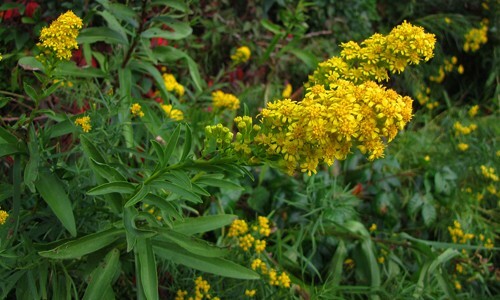 Seaside goldenrod is a native perennial plant with large, golden yellow flower clusters that bloom in late summer and autumn. 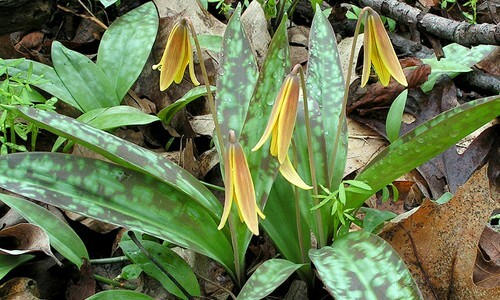 Trout lily is a native perennial plant with nodding yellow flowers that bloom in early spring. 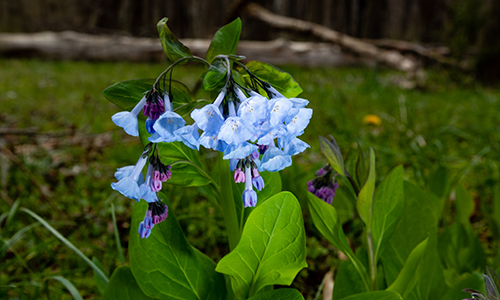 The Virginia bluebell is a perennial with blue, trumpet-shaped flowers that bloom in spring. It can be found throughout the Chesapeake watershed. 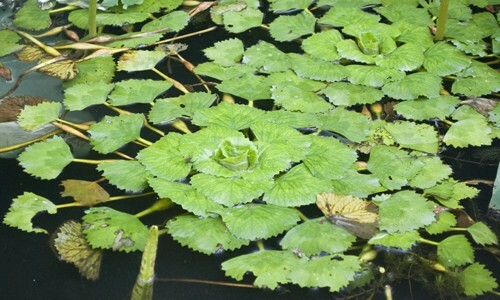 Water chestnut is an invasive aquatic plant with rosettes of triangular leaves that float on the water’s surface. 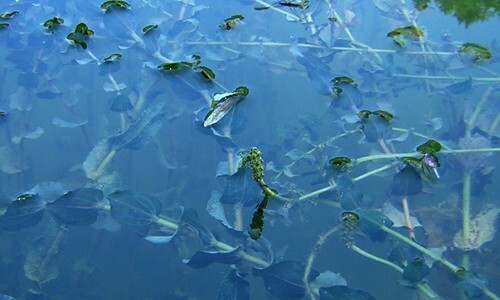 It grows in the Bird and Sassafras rivers, which are tributaries of the upper Chesapeake Bay. 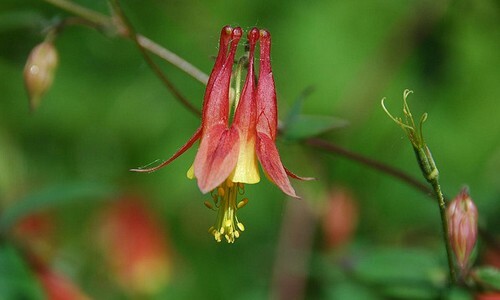 Wild columbine is a native perennial plant with nodding, bell-shaped, red and yellow flowers that bloom in spring and early summer.